Trains offer an excellent way to travel between Morocco's main cities. The country's rail network is often lauded as one of the best in Africa, and the trains are comfortable, usually on time and most importantly, safe. Night trains allow you to travel after dark, instead of wasting daylight hours that could be spent sightseeing and exploring. They also add to the romance of trans-Morocco travel - especially if you pay extra for a sleeper bunk. Where Do Morocco's Night Trains Go? All Moroccan trains, including those that run in the day, are operated by ONCF (Office National des Chemins de Fer). Night trains are defined as those equipped with sleeping cars, and there are four separate services to choose from. One travels between Marrakesh in the center of the country and Tangier, the iconic entry port on the shores of the Strait of Gibraltar. Another travels between Casablanca (on Morocco's Atlantic coast) and Oudja, located in the country's northeast corner. There is a route from Tangier to Oudja, and one from Casablanca to Nador, also located on the northeast coast. The first two routes are the most popular, and their details are listed below. There are two-night trains on this route, one traveling in either direction. Both have a selection of normal cars with seats, and air-conditioned sleeper cars with beds. It is possible to reserve a single cabin, a double cabin or a berth with up to four bunk beds. The train stops in Tangier, Sidi Kacem, Kenitra, Salé, Rabat City, Rabat Agdal, Casablanca, Oasis, Settat, and Marrakesh. The train from Marrakesh departs at 9:00 pm and arrives in Tangier at 7:25 am, while the train from Tangier departs at 9:05 pm and arrives in Marrakesh at 8:05 am. Trains run in both directions on this route as well. The service is called a "Train Hotel" by ONCF, and it is special in that it offers beds to all passengers. Again, you can order single, double or berth accommodation. Those that book a single or double cabin will also receive a complimentary welcome kit (including toiletries and bottled water) and a breakfast tray. 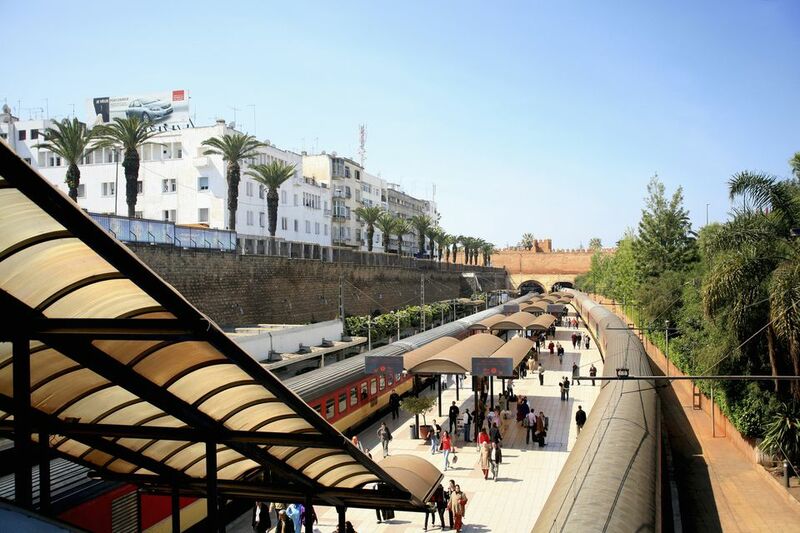 This train stops in Casablanca, Rabat Agdal, Rabat City, Salé, Kenitra, Fez, Taza, Taourirt, and Oudja. The train from Casablanca departs at 9:15 pm and arrives in Oudja at 7:00 am, while the train from Oudja departs at 9:00 am and arrives in Casablanca at 7:15 am. At the moment, it is not possible to book train tickets from outside the country. ONCF does not offer an online booking service, either, so the only way to make a reservation is in person at the train station. Advance reservations are mandatory for sleeper cars on the Tangier to Marrakesh line, although it is often possible to pay for a seat on these trains at the time of travel. Advance booking is advisable for all other routes, especially the popular Casablanca to Oudja line. If you can't be there in person to book a ticket a few days ahead of your intended departure time, ask your travel agent or hotelier if they can make the reservation for you. Prices on Morocco's night trains are fixed for all routes, regardless of your departure and arrival stations. Single cabins are priced at 690 dirhams per adult, and 570 dirhams for children under 12 years of age. Double cabins cost 480 dirhams for adults and 360 dirhams for children, while berths are the most affordable option at a price of 370 dirhams/ 295 dirhams respectively. Some routes (including the Tangier to Marrakesh line) also offer seats, which are less comfortable but more competitively priced for those traveling on a budget. First and second class seats are available. Single and double cabins include a private lavatory, a sink, and an electrical outlet, while berths share a communal bathroom at the end of the carriage. Food and drink are available for purchase from a mobile refreshment cart. You can also pack your own food and drink - a good idea if you have specific dietary requirements. This article was updated by Jessica Macdonald.